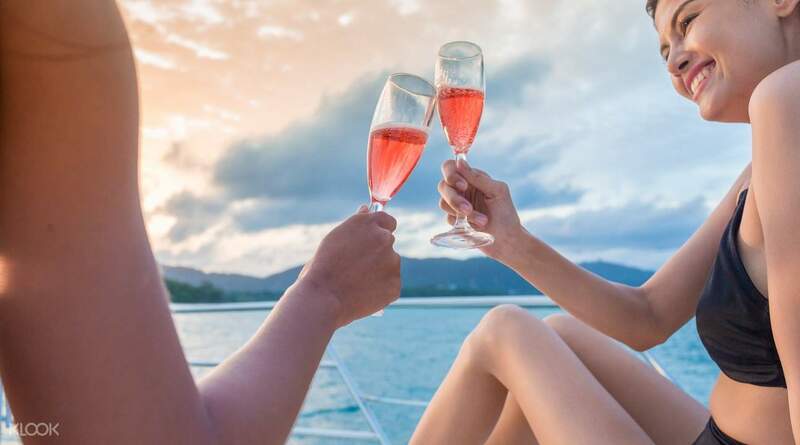 Enjoy a luxurious cruise to Koh Racha Yai and Racha Noi on a luxury motor yacht! Set sail on a catamaran by joining the Racha and Coral Island Sunset Day Tour with Snorkeling by Catamaran! The cruise to racha yai and racha noi was really enjoyable. There was enough time to enjoy the sun, snorkel and see many fish. The experience didn’t feel rushed and the guides were very friendly. Lunch and snacks provided were good, though breakfast could have been better. Luckily we had already eaten breakfast before arriving. All in all, we were satisfied with our experience and would do it again! Thanks Klook and expecially to our guide Bia, who was very friendly and gracious! Follow the inviting call of the Andaman sea to explore an exotic utopia on a Koh Racha Yai and Racha Noi Island sunset day tour! These two stunning Phuket wonders promise a one-of-a-kind tropical experience to satiate your desire for relaxation and leisure. 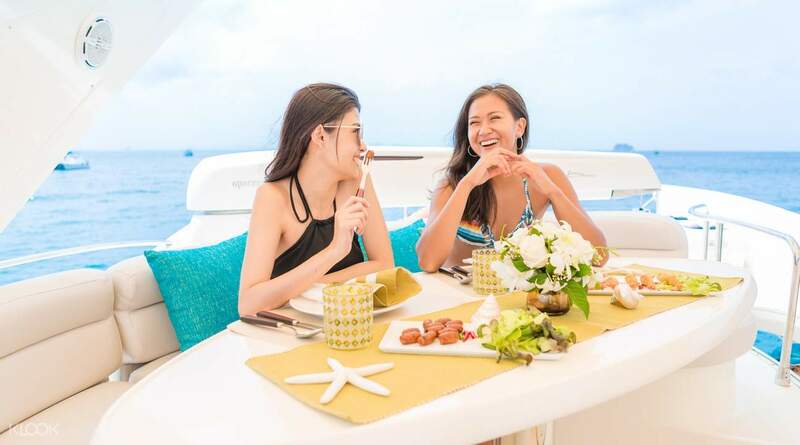 Begin your Phuket yacht tour adventure with a convenient hotel pick up in Phuket and arrive at the pier to board the luxurious motor yacht. Journey to Racha Noi and enjoy the viewing deck. Surrounded by the vast Andaman sea, soak in breathtaking views as you speed along clear, blue waters. Upon arriving on Racha Noi, gear up and snorkel down to see a magnificent array of marine life. Swim among various sea creatures and get a glimpse of natural habitats of seafaring species. After that, why not spot some wild dolphins if you can? Back on the boar, fill your appetite with a delicious Thai lunch as you head towards Koh Racha Yai. Embrace paradise––relax, tune out your worries and enjoy the serene island ambiance. You can also snorkel at a nearby spot if you wish! On your way back to the pier, don’t miss out on an incredible sunset and fishing experience. Truly escape the clutches of the city and step into paradise for a day on Phuket’s hidden natural gems. The experience was excellent. The crew were excellent. Food and venues terrific. Racha Noi was crazy busy and a bit too long there. Racha Yai was beautiful and deserved more time. The boat is not as advertised. It is an upper end tour boat, not a luxury yacht (I own one so know the difference). However, the boat was very good, well suited to the activities, and was probably the best one we saw all day. Would recommend this trip to anyone. The experience was excellent. The crew were excellent. Food and venues terrific. Racha Noi was crazy busy and a bit too long there. Racha Yai was beautiful and deserved more time. The boat is not as advertised. It is an upper end tour boat, not a luxury yacht (I own one so know the difference). However, the boat was very good, well suited to the activities, and was probably the best one we saw all day. Would recommend this trip to anyone. The cruise to racha yai and racha noi was really enjoyable. There was enough time to enjoy the sun, snorkel and see many fish. The experience didn’t feel rushed and the guides were very friendly. Lunch and snacks provided were good, though breakfast could have been better. Luckily we had already eaten breakfast before arriving. All in all, we were satisfied with our experience and would do it again! Thanks Klook and expecially to our guide Bia, who was very friendly and gracious! The cruise to racha yai and racha noi was really enjoyable. There was enough time to enjoy the sun, snorkel and see many fish. The experience didn’t feel rushed and the guides were very friendly. Lunch and snacks provided were good, though breakfast could have been better. Luckily we had already eaten breakfast before arriving. All in all, we were satisfied with our experience and would do it again! Thanks Klook and expecially to our guide Bia, who was very friendly and gracious! This tour was so good, the best part was the staff. They were so attentive and caring. In Phuket everyone we met was so nice and helpful. Well the bad part of this tour was before the tour happened, it is actually part my fault too since I booked it 3 days before. They did not send me a confirmation in 48 hours so I emailed klook if this tour is happening or not, they replied me by saying the operator said not enough people so can’t confirm. Also the customer representator at klook said there is a chance it’s going to cancel and I can book another one. So I booked another tour. I got an confirmation for that tour so fast and I was relieved. The day before the tour at around 4pm I receive an email saying this tour is also confirmed when I already have sent a cancellation email. So all together I had 2 tours booked on the same day. My whole afternoon at Thailand got ruined with me calling the klook team. To be honest they were of no help, they just kept on saying they have already emailed the operator but the operetor haven’t emailed them back. So I called them at 10pm, asking them what can I do, how can I cancel either one, they say the same thing “the operator hasn’t called back and the worst case scenario would be two tours waiting for me at my hotel” . I told them to call the operators since they are not responding to emails. The klook representative finally called the agency and told me I cannot cancel either one, but I can move the dates. I finally said okay and thanked the klook representative. All in all this tour was amazing, the staffs are great.Our English tour guide was so nice, he even guided me when we were snorkelling coz I was so scared to swim. I 100% recommend to book this trip but book it before hand so you don’t have any problems like I did. This tour was so good, the best part was the staff. They were so attentive and caring. In Phuket everyone we met was so nice and helpful. Well the bad part of this tour was before the tour happened, it is actually part my fault too since I booked it 3 days before. They did not send me a confirmation in 48 hours so I emailed klook if this tour is happening or not, they replied me by saying the operator said not enough people so can’t confirm. Also the customer representator at klook said there is a chance it’s going to cancel and I can book another one. So I booked another tour. I got an confirmation for that tour so fast and I was relieved. The day before the tour at around 4pm I receive an email saying this tour is also confirmed when I already have sent a cancellation email. So all together I had 2 tours booked on the same day. My whole afternoon at Thailand got ruined with me calling the klook team. To be honest they were of no help, they just kept on saying they have already emailed the operator but the operetor haven’t emailed them back. So I called them at 10pm, asking them what can I do, how can I cancel either one, they say the same thing “the operator hasn’t called back and the worst case scenario would be two tours waiting for me at my hotel” . I told them to call the operators since they are not responding to emails. The klook representative finally called the agency and told me I cannot cancel either one, but I can move the dates. I finally said okay and thanked the klook representative. All in all this tour was amazing, the staffs are great.Our English tour guide was so nice, he even guided me when we were snorkelling coz I was so scared to swim. I 100% recommend to book this trip but book it before hand so you don’t have any problems like I did. Fantastic day trip, Would highly recommend to anyone who is looking for good service, great time and seeing the best places that aren't always listed on main tour guides.great care of all our worries with the best one to one service we have received from any boat tours before. Everything was set up to perfection including food and drinks. Had one of the best days during our holiday in Phuket! Fantastic day trip, Would highly recommend to anyone who is looking for good service, great time and seeing the best places that aren't always listed on main tour guides.great care of all our worries with the best one to one service we have received from any boat tours before. Everything was set up to perfection including food and drinks. Had one of the best days during our holiday in Phuket! We booked this trip via KLOOK page and it was a brilliant day. From there you can have snacks and you listen to a short and funny presentation. We boarded to the luxury yacht and the interior was so awesome. 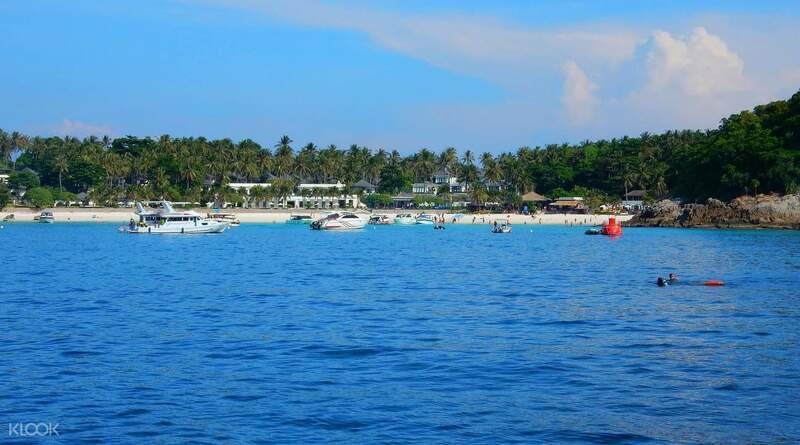 From my experience, we had a great time for the island hopping adventure. We booked this trip via KLOOK page and it was a brilliant day. From there you can have snacks and you listen to a short and funny presentation. We boarded to the luxury yacht and the interior was so awesome. From my experience, we had a great time for the island hopping adventure. We had an awesome boat trip. The boat was amazing and super fast, the crew were very friendly and most importantly,a fabulous host and took great care of us and had a great itinerary that worked perfectly. She was incredibly organised and got the vibe just right for what we were looking for. Would 110% come back again and do another trip! We had an awesome boat trip. The boat was amazing and super fast, the crew were very friendly and most importantly,a fabulous host and took great care of us and had a great itinerary that worked perfectly. She was incredibly organised and got the vibe just right for what we were looking for. Would 110% come back again and do another trip! Definitely recommend for this attraction. The boat captain was a very nice guy and very informative.The staff were very friendly and helpful, the food was good and the whole day outing was well organised. We particularly enjoyed exploring the beach and swimming. This tour was definitely worthwhile. This was the total highlight of our week-long holiday in Phuket with my family. Thank you Klook! to did our best memories on our long holiday! Definitely recommend for this attraction. The boat captain was a very nice guy and very informative.The staff were very friendly and helpful, the food was good and the whole day outing was well organised. We particularly enjoyed exploring the beach and swimming. This tour was definitely worthwhile. This was the total highlight of our week-long holiday in Phuket with my family. Thank you Klook! to did our best memories on our long holiday! This trip made our vacation perfect! Phuket is known for beautiful islands,The host, the staff on board were all fantastic and welcoming, making sure we were comfortable and enjoying ourselves.We spent the day exploring beautiful secluded islands of Phuket. Thank you again for your hospitality and for a memory I will never forget! This trip made our vacation perfect! Phuket is known for beautiful islands,The host, the staff on board were all fantastic and welcoming, making sure we were comfortable and enjoying ourselves.We spent the day exploring beautiful secluded islands of Phuket. Thank you again for your hospitality and for a memory I will never forget! Absolutely beautiful! the team was soooooo very nice professional and so thoughtful I highly recommend !!!!! My travel buddies and I all had great things today and we so enjoyed this position of the trip. The best day we’ve day here in Phuket. Fantastic day from start to finish. The buffet lunch was good better than any buffet lunch we’ve had on previous tours. Absolutely beautiful! the team was soooooo very nice professional and so thoughtful I highly recommend !!!!! My travel buddies and I all had great things today and we so enjoyed this position of the trip. The best day we’ve day here in Phuket. Fantastic day from start to finish. The buffet lunch was good better than any buffet lunch we’ve had on previous tours.